An original signed three color lithograph on handcut Arches paper by German-American artist Josef Albers (1888-1976) titled "WLS I", 1966. Hand pencil signed, dated by Albers lower right and titled, numbered lower left. Limited edition: 124/125. Portfolio: 'White Line Squares (Series I)', a portfolio of 8 prints. Arches watermark at right center margin. Printed by Kenneth Tyler with Jim Webb and Bernard Bleha at Gemini G.E.L., Los Angeles, CA. Published by Gemini G.E.L., Los Angeles, CA. *Note: there is no Gemini G.E.L. chopmark/blindstamp lower right. It has been confirmed by The Josef and Anni Albers Foundation that some impressions of "WLS-I" and "WLS-IV" from 'Series I' did not receive their chopmarks/blindstamps as intended - a simple printing error. Our example here is one of these very rare cases. Provenance: Private Collection - Memphis, TN; Barbara Krakow Gallery, Boston, MA with their original label on verso. 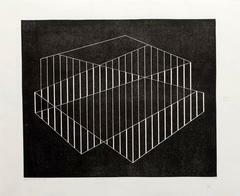 Reference: Catalogue Raisonné: 'The Prints of Josef Albers' by Danilowitz: 171.1, page 114. The print is floated over top a mat and framed with a contemporary white metal frame with UF3 (Ultra-Violet Filtering Plexiglass). Framed size: 22" x 22". Sheet size: 20.75" x 20.75". Image size: 15.75" x 15.75". In excellent condition. Josef Albers, (born March 19, 1888, Bottrop, Ger.—died March 25, 1976, New Haven, Conn., U.S.) painter, poet, sculptor, teacher, and theoretician of art, important as an innovator of such styles as Colour Field painting and Op art. From 1908 to 1920 Albers studied painting and printmaking in Berlin, Essen, and Munich and taught elementary school in his native town of Bottrop. In 1920 he enrolled at the newly formed Bauhaus, which was to become the most important design school in Germany. His most important creations of that period included compositions made of coloured glass, as well as examples of furniture design, metalwork, and typography. After 1925, when he became a “master” at the Bauhaus, Albers explored a style of painting characterized by the reiteration of abstract rectilinear patterns and the use of primary colours along with white and black. In 1933, when the Nazi government closed the Bauhaus, Albers left Germany for the United States. On the recommendation of architect Philip Johnson, Albers organized the fine-arts curriculum at Black Mountain College in North Carolina, where he taught until 1949. The next year he began a 10-year tenure as chairman of the art department of Yale University. Over the course of his time at these two schools, he counted among his students Eva Hesse, Robert Rauschenberg, and Kenneth Noland. After moving to the United States, Albers concentrated on several series of works that systematically explored the effects of perception. In his series of engravings on plastic Transformations of a Scheme (1948–52) and in the series of drawings Structural Constellations (1953–58), he created complex linear designs, each subject to many possible spatial interpretations. 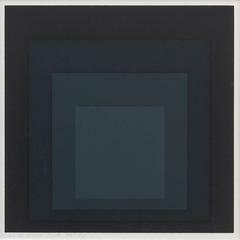 His best-known series of paintings, Homage to the Square (begun in 1950 and continued until his death), restricts its repertory of forms to coloured squares superimposed onto each other. The arrangement of these squares is carefully calculated so that the colour of each square optically alters the sizes, hues, and spatial relationships of the others. These works were exhibited worldwide and formed the basis of the first solo exhibition given to a living artist at the Metropolitan Museum of Art, New York City, in 1971. The German-born American painter, writer, and educator Josef Albers (1888-1976) was a pioneer of 20th century modernism, and an innovative practitioner of color theory. With his wife, the textile artist and printmaker Anni Albers (1899–1994), he shaped the development of a generation of American artists and designers through his teaching at the experimental Black Mountain College in North Carolina, and later at Yale University School of Art, where he was the chairman of the Department of Design from 1950-1958. He is widely known for his series of prints and paintings Homages to the Square, which he created between 1950 and 1975. His influential volume on color theory Interaction of Color was published in 1963. Albers was born in Bottrop, Germany, and as a young man he studied art education, earning certification from the Königliche Kunstschule in Berlin in 1915. He entered the legendary Bauhaus school in Weimar in 1920. The Bauhaus had been established by Walter Gropius in 1919, in the immediate aftermath of World War I, with the hope that its innovative curriculum would foster connections between architecture, art, and traditional crafts. In 1923 Albers began teaching the Vorkurs, the introductory class in which new students learned to work with each of the key artists’ materials, along with color theory, composition, construction, and design. Albers was a polymath, and the multidisciplinary environment of the Bauhaus was fertile ground for his artistic ambitions. When the school moved from Weimar to Dessau in 1925, he became a full professor, and in addition to glass and metal, he designed typefaces and furniture. While at the Bauhaus, Albers drew inspiration from the work of his colleagues, the color theorist Johannes Itten, and the painter, photographer, and designer László Moholy-Nagy, with whom he co-taught the Vorkurs. In 1933, the Bauhaus was shut down due to pressure from the Nazi Party, which perceived the school as being sympathetic to communist intellectuals. As Albers’ wife Anni was Jewish, the couple resolved to leave Germany, and settled in rural North Carolina. The architect Philip Johnson helped make arrangements for Albers to join the faculty of Black Mountain College as the head of the painting program, where he remained until 1949. While at Black Mountain, both Josef and Anni Albers became influential mentors to American artists including Ruth Asawa, Cy Twombly, and Robert Rauschenberg, while working alongside fellow professors Buckminster Fuller, John Cage, Merce Cunningham, and William de Kooning. In 1950, joined the faculty of the Yale University School of Art where he would head the newly established Department of Design until his retirement in 1958. In the 1950s, the Alberses began taking trips to Mexico, where the colors and forms of the local art and architecture inspired both artists. In 1971, Albers became the first living artist whose work was the subject of a solo retrospective at the Metropolitan Museum of Art. 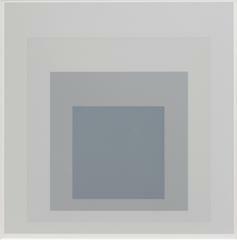 Though they worked in different mediums, Josef and Anni Albers’ work shares a fascination with color and geometry. Josef Albers’ compositions from the Homages to the Square series, such as Formulation: Articulation Portfolio II Folder 28 (B), from 1972 give deceptively simple shapes a novel vibrance as colors play off of one another. The hues in Articulation Portfolio II Folder 28 (B) work in concert to give the flat surface the distinct appearance of a tunnel or other 3-dimensional space; while the form on the left appears to move towards the viewer, the form on the right seems to lead directly into the canvas. Similarly, Anni Albers’ designs for textiles use graphic design to lend a sense of dynamism to flat works. Her Study for Unexecuted Wall Hanging (Bauhaus), from 1984 is a Mondrian-like pattern for a weaving in which different colors alternately recede and advance into the foreground, giving the image a sense of complexity and uncanny depth. Josef Albers also created works of public art, including a delicate, geometric gold leaf mural called Two Structural Constellations for the lobby of the Corning Glass building in New York City in 1959. He designed a work called Two Portals for the lobby of the Time & Life Building in 1961, in which which and brown bands move towards two square panels made of bronze. Walter Gropius invited Albers to create a piece for the Pan Am Building, which he was designing with the architectural firm of Emery Roth & Sons. Albers reworked an existing glass piece from his Bauhaus days called City, and, fittingly, renamed it Manhattan.